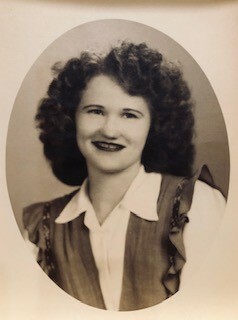 Esther Mae Williford Morris, 94, of Sherwood passed away Thursday, April 11, 2019. She was born December 24, 1924 in Jacksonville, Arkansas to the late Charlie and Helen Williford. She loved fishing and was an avid gardener. She was preceded in death by her husband, Paul Samuel Morris; children, Ernestine Morris Griffith, Pauline Morris Hix, Ellen Morris Gobble and Melvin Eugene Morris; and seven siblings. She is survived by her son-in-law, Donald Hix; grandchildren, Samuel Goodman, Gerald Lybrand (Kathy), Pamela Ausburn (Eddie), Christopher Lybrand (Mary), Angela Turney, Melissa Tackett (John), Michale Hale (Larry), Carl Morris, James Morris and Drew Ware; numerous great-grandchildren and great-great-grandchildren. Memorials may be made to Alzheimer’s Association, 10201 W. Markham St., Ste. 100, Little Rock, Arkansas 72205, www.alzark.org or Charity of your Choice. Funeral services will be 2:00 p.m., Monday, April 15, 2019 with a visitation prior to service at 1:00 p.m., at Smith – North Little Rock Funeral Home, 1921 Main Street. Burial will follow in Harmony Cemetery.